Who says service is serious? 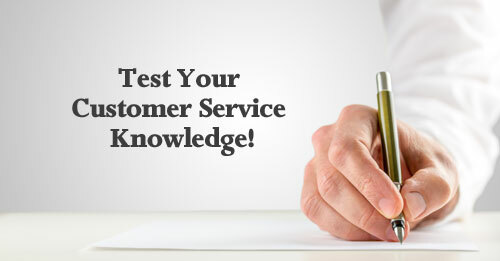 Take this fun quiz to test your customer service knowledge. You may be a service ace if you pick the correct answer to each of these ten questions, and understand why these answers are correct. 1. D. Customers are often wrong but they never stop being the customer. Right or wrong they are to be accorded respect and cared for. Focus on the insights their complaint offers. 2. D. Complaining customers alert you to systemic problems before they drive off more customers. Their complaints represent many more customers who may not spend the time to tell you about problems, instead just leaving you for your competitors. 3. C. Your staff deserves and thrive on recognition and appreciation. Take the time to celebrate them collectively and individually. Whether through cards, gifts, surprises, outings and acknowledgements at company functions, let them know how important, valued and appreciated they are to you and the company. 4. E. CRM refers to systems designed to track and cater to each customer’s whims and preferences over a lifetime. CRM is about managing customer relationships over the long haul by attending to their individual needs. 5. B. Complaining customers have several needs. Implicit in their actual complaint is also a need to be heard and their unhappiness acknowledged. Fixing the problem is important. So is letting them know you understand their displeasure and feel for them. One without the other is an incomplete remedy for customer complaints. Don’t forget the emotional component in complaints. 6. B and C. When you solve a problem for a customer you actually build confidence and allegiance. You’ve proven you stand behind your products or service, giving customers a warm and fuzzy feeling of safety and protection. As well, you tap the pulse of the customers. Their complaints and feedback give valuable insight into how well your products are assembled, documented, sold and hold up. Listening to customers tells you a great deal about your company’s products and services (and your competitors’ too) from real life customers. That’s invaluable! 7. D. A Customer Service orientation must transcend the service department. All departments must understand and model good customer service for the company to be considered strong in service. Many problems can be avoided outright by attending to customer service. Why should the customer service department carry the weight of service for the entire company. Don’t operate under the adage “never enough time to do it right but always enough time to do it over.” Get it right at the source, in all departments. 8. D. Make your call center is a shining example of your company’s commitment to its customers. Your center is a visible symbol of your company’s commitment to customer success. 9. D. Customer Care is a philosophy wherein customers are cared for by a company – the entire time they’re customers. Care isn’t just to be administered as a salve for problems. Demonstrate care from the start and your customers will flock to your products and services. 10. D. Customer Service Culture is the infusion of service ideals into every department, from sales, shipping and receiving to legal, human resources and beyond. Craig Harrison is a speaker, trainer and consultant who makes communication and customer service fun and easy for his clients. Customer Service – Isn’t It Obvious? I would like to ask, why “7. For a company to be considered service-oriented:” why is it not mentioned “customer service” in its mission statement? Previous article: Dealing with Customer Complaints – B.L.A.S.T. Next article: Customer Service or Customers Serve Us?